Recognizes a protein of 180 kDa, identified as CD11a (Leucocyte Workshop II; Code N202). JY, HUT-78, MOLT-4, HL60, U937, and human leukocytes. Human lymph nodes and tonsils. Recognizes a protein of 180 kDa, identified as CD11a (Leucocyte Workshop II; Code N202). CD11a complex with the 2 subunit of the integrin family, CD18, to form the cell surface heterodimer, LFA-1 or CD11a /C18 (aLbL). LFA-1 is expressed on all leukocytes including lymphocytes, monocytes, and granulocytes. It is involved in leukocyte adhesion to its ligands including intercellular adhesion molecule-1 (ICAM-1 or CD54), ICAM-2 (CD102), ICAM-3 (CD50) and Telencephalin (TLN) and play a role in most immune/inflammatory responses. 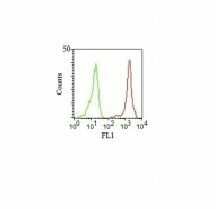 Catalog number key for antibody number 0151, Anti-CD11a (Cris-3) The prefix indicates conjugation, followed by the antibody number and size suffix.